eed a laundry refresh? Nine instructors reveal their strategies for keeping their SOUL gear in tip-top shape and smelling great. Turn It Up got you piling up bags of workout clothes? Some of our favorite SoulCycle instructors have just the tips you need to keep it fresh this fall. 2. Let the clothes freeze completely (you can keep them in as long as you wish). Six to 12 hours before doing laundry, remove from freezer and tear a hole in the plastic bag. Let the clothes defrost (it sounds funnier than the actual process ;) )! 3. Laundry time! Load up your washer (you can combine with your other clothes), using Tide Febreeze Sport, and run a normal cycle with cold water. Dry as directed (some workout clothes suggest you air dry them, so follow whichever drying instructions the brand directs — the bacteria-killing phase is complete once the clothes are washed). Then get back on a bike and ride with the knowledge that there is no amount of sweat that can keep you from smelling fresh! My class is pretty intense, so I am drenched in sweat afterward. I literally go straight into the shower completely clothed and peel off each article of clothing, rinsing out all my sweat immediately. That way my sweat never has a chance to attach to the fibers of the workout gear. I then hang dry them in my hamper at home and after my final class of the week on Sunday, I wash them all properly with Gain detergent (I love the smell)! I stay on this cleaning schedule strictly, so I'm always prepared for any additional classes I need to sub. The classic Tide detergent is my jam! I throw OxyClean in there and wash on super hot. White vinegar during the wash and air drying my clothes are my two keys to keeping everything smelling decent and lasting a long time! After class I ALWAYS shower, unless I'm headed somewhere else where I'm going to sweat again (i.e. hot yoga), in which case I just change my clothes. Either way, I get my sweaty clothes off me ASAP and I put my leggings and sports bra in two separate sweat bags. The first thing I do when I get back to my apartment is TAKE THEM OUT. The sooner the air can get to them the better! Well, my bestie and fellow soul sister Tiff Chen recommended Hex Performance Detergent and it changed my life! 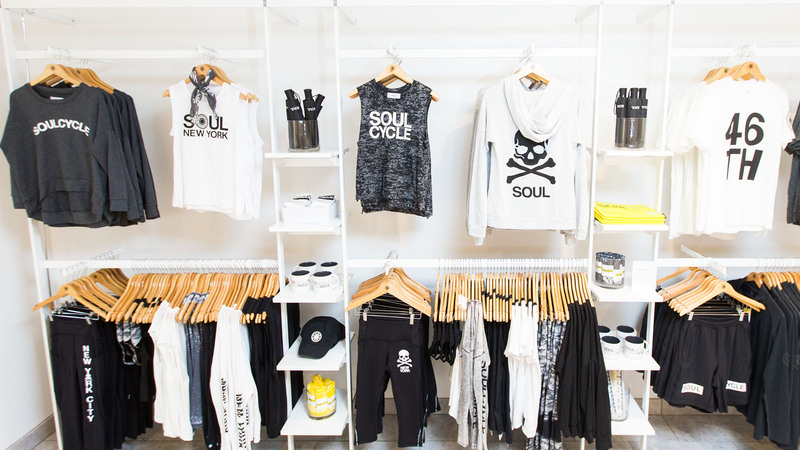 One tip: Take your sweaty clothes out of our convenient SoulCycle plastic bags ASAP! And let them hang dry BEFORE you toss them in your dirty clothes hamper. If you toss a bunch of wet clothes into the hamper, it's hard to get the stench out. Even AFTER they've been washed. As soon as I get home from class, I throw my wet clothes (in the plastic bags) into my freezer. My fellow instructor, Ryan Lewis, told me about this technique and it seems to be working great! Freezing clothes helps to get rid of the bacteria that makes them smelly, and is a great place to leave my clothes since I don't want to do laundry after every single class (ain't nobody got time for that), opposed to wet and smelly in my laundry basket. Another key is that I WASH ALL OF MY WORKOUT CLOTHES TOGETHER using Tide Sport. Here's the deal: Most of our workout clothes are made of spandex and lycra, and these fabrics attract cotton fibers (from jeans, towels, sweaters, etc.) in the washer/dryer, which can lead to pilling and shorter lifespan of these items. So, don't mix with everyday clothes! Another thing to avoid is fabric softener. Fabric softener leaves a coating on our workout clothes, which ruins the integrity of the fabric (i.e. sweat wicking, etc. ), and leaves them feeling really static-y. I'm lucky to have a washer/dryer in my apartment unit, so I do about three loads of "workout laundry" per week. So far following these guidelines work really well, and I haven't had to throw out too many items due to lingering stank! It's an ever-uphill battle! I always take them out of the Soul sweat bag as soon as I'm home and actually have a separate bin for my clothes that I teach in versus my outside of class clothes. They have to be washed within three days. I tend to do laundry two to three times per week; I find that the sooner you wash them, the longer they live. I use Tide Sport detergent as well as the pods and it usually does the trick. Then I hang dry everything but the socks, and that's usually how it goes down. Also, if I have an item or a few that simply need a re-start, I'll soak them in vinegar before throwing them in the wash.
How Long Is Too Long to Stay in Sweaty Workout Clothes After Class?